Gaza, July 22, A few days ago, a whirl of windy allegations stirred when news alleging that a Christian in Gaza was forced into conversion. The Christian community in Gaza decreases each year due to immigration and other reasons. Christians consider themselves a minority with only 3000 approx. of them left in Gaza. The story that surfaced was personal to me, not only as a journalist, but as a person who knew Ramez Al Amash from school and sat beside him in the class room for two consecutive years. I have many Christian friends here in Gaza so this story meant something to me. I chose to wait and take my time in researching so I don’t end up giving them or Muslims any injustice. Al Amash family, along with other Christians, staged a public protest infront of the Palestinian legislative council last week in Gaza. They claimed their son was kidnapped after they found a piece of paper with his hand writing saying: "I converted to Islam, Please forgive me". They escalated the whole issue by getting all media involved; they even turned to their church seeking involvement. Western media rushed to the scene in a frenzied enthusiasm, they finally got the chance of backing up their false claims that turns Gaza into an Islamic medieval city. Archbishop Alexius, Orthodox Church in Gaza, rushed to issue a statement to the press accusing "militant Islamic groups" in Gaza of kidnapping Christians and forcing them into conversion using "dirty ways" and terrorism. He accused those groups of kidnapping 5 congregants in Gaza (Ramez Al Amash, Hiba Abu Dawood and her three girls). LA Times, AP, Fox news and numerous other western media in addition to Islamophobic websites jumped on the story once it went viral, they wanted to exploit it. They forget their objectivity and professionalism and decided not to wait or verify their stories. 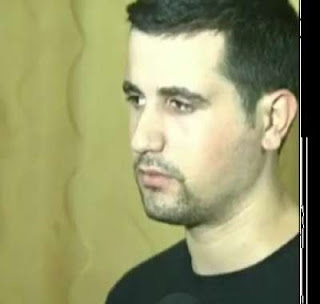 PCHR weighed in and planned a friendly meeting with Ramez and his parents. He assured them that the video showing him saying he is fine and he converted out of conviction was true. His father accepted the new Ramez but his mother kept telling him to say the truth. 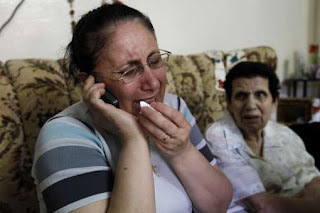 Mona Al Amash, Ramez's mother, was deep in denial. She issued sizzling statements to all press saying that no matter how long everyone and Ramez keep telling her that Ramez converted out of conviction; it will remain untrue to her. "I know how I raised him, I know who he is, and he can't become a Muslim in two days. I don’t care about the video or Ramez's assurance; I am sure my son is still a Christian and will forever be one," she added while sobbing. Rumors surfaced saying that Ramez fell in love with a Muslim girl and she either taught him about Islam or asked him to convert as a condition of their marriage. Christians spread this rumor and said that Ramez told his parents about her but they rejected the whole idea. Ramez and his family remain silent about this story, they chose not to comment. Another rumor surfaced of Ramez being beaten up when he went to visit his fainted mother in the hospital after she heard the news. His family said that she entered shouting "I am still a Christian mom" and then he was beaten with his mother and sister. The story turned out to be untrue. The real story goes like this: Ramez tried to soften things for his mother so he told her he is still a Christian and she should wake up, he was then grabbed by his family so the Police had to intervene and take him away to a safe place. This story was confirmed by Ayman Al Batniji, Police Chief in Gaza, and many other witnesses. Ramez, 24, stopped talking to the media but accepted to talk to me as his friend. He told me that he wanted to become a Muslim for over five months; he has been living like one and hiding it from his family. "I turned to Sheikh Salem Salamah, Association of Muslim Scholars in Gaza, four times and asked him to help me become a Muslim but he would reject me and ask me to go back to my family. Until the last time, I went and begged him to listen to me and help me. I assured him that I still want to be with my family but I want to convert to Islam after full conviction. He accepted and he helped me," Ramez added with a tired voice. "I was overwhelmed with all the media and all the organizations that intervened and I couldn’t understand the deep denial my mother was in and I was worried about her. They say I wasn’t normal in the youtube video. Yes, I wasn’t normal, I was tired and overwhelmed. I didn’t think my story will have such consequences," Ramez concluded. Archbishop Alexius shared his regret of issuing such a statement from the Orthodox Church in Gaza before verifying Ramez and Hiba's stories and relying on allegations only. Especially after the statements of Bassem Na'eem, Gaza minister of health and Ayman Batniji, Gaza police chief, which asked the "Christian brothers and sisters" to verify the stories and accept the new conversions so as to not ruin the great brotherhood between Christians and Muslims in Gaza. Mona Al Amash and The Orthodox Church in Gaza both made heated statements about the Christians' future in Gaza after all these conversions. They claimed that the Christians in Gaza will face distinction, blaming "Militant Islamic Groups" which turned out later to be just allegations and those congregants converted out of conviction. Ramez decided to go and live with his family because he loves his family and in Islam family ties are honored on a high level. He expects hardships and obstacles to be a new Muslim living between a Christian family but he will do his best to survive until he gets married and move out or move out after he did his best to surpass any hardships. Ramez's mother remains in full denial and still insists that her son is a Christian who was forced into conversion despite the assurance and confirmation of Ramez himself, Association of Muslim Scholars, Gaza police, PCHR and many others. But this is understandable, Christian community here is a minority and they are very protective. Many conversions happened and the first reaction would always be "denial". Moving on to Hiba Abu Dawood's story, Hiba studied at the Islamic University in Gaza. She had to study many Islamic subjects within her major. She started asking questions to her professors, friends and classmates about Islam. She was very interested. Hiba started parting away from her Christian husband. Yet, he suspected nothing. She started changing and she started exploring Islam. She was very moved and touched by the Islamic prayer and fasting. "I always wanted to be closer to god, now I have five chances everyday to pray for God and make dua. I love fasting, its so spiritual," Hiba added happily. Hiba confirms strongly that she converted out of full conviction and after a long time of thinking. "I made my decision," she added strongly. Hiba sent her family a message saying she misses them all and she will always love them but she made her decision and she hopes they accept her as a convert. "I am staying with a family who heard about my story and wanted to adopt me. They take care of me and my three girls, they provide us with everything we need and they help me learn more about Islam. I am very comfortable and happy. I am not sick like my family has been told," Hiba added. "I hope my family isn’t sad or angry with me, they are welcome to visit me anytime," Hiba concluded. Hiba then was surprised after she learned that the church is asking for the custody of her three daughters claiming that they are still Christians and they want to make sure they are well and not forced or hated. I will fight for them if they were taken by force," Hiba added chokingly through a phone call. A story also surfaced of a New Zealander Journalist who came to Gaza a year ago and decided to stay then converted to Islam. Her name is Julie and she said that she belonged to Islam even before she heard about it. Many other stories of new converts surfaced and yet many other rumors circled them. But the truth has to shine at the end just like the truth about Ramez and Hiba surfaced at the end. Warning: This is very raw, emotional and looooong. July 8, Gaza, I don’t know from where to start. Should I try to remember the beginning or jump right to the end or just honor the middle by mention it first. I had this strong intuition that 2012 will be an eventful year, a year of unprecedented events, a year of laughter and sobs and a year that I will remember for the rest of my life. Oh boy, Its July and till now I am very right. 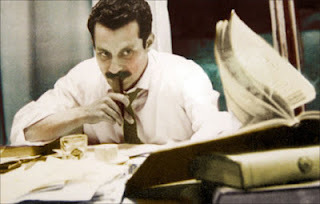 Let me start by honoring Ghassan Kanafani, who ignited the inspiration behind this blog post after the abandonment to my blog for a little over a month ago. 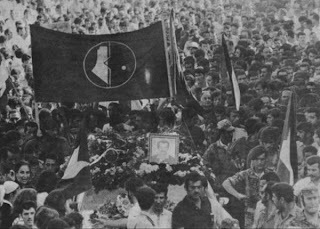 Today, we commemorate the 40th anniversary of Israel's brutal assassination of Ghassan in Beirut by blowing his car up. Yes, he had a dangerously artistic mind that overflowed with influential work that touched the hearts of numerous people around the world. He needed to be silenced. Yet, 40 years today after his death, his voice remains stronger or even stronger than ever. His words touch me like he wrote them today to me only and his work is highly known and searched for by many people around the world. Voices like Ghassan cant be silenced. By now, most of you became familiar with my weirdness and eccentricity (or I hope you are). I relate to many different things, I belong to many different people\nations\things\countries and I bond with numerous things and people. Ghassan Kanafani is a special case. I remember saying: "I think I know this man", when I first saw his picture. I read allot about him and I kept feeling like I know him. His face is so familiar, the curve of his mouth when he smiles is familiar, the way he glares is familiar, the way he thinks is familiar and the way he writes is very familiar. I feel like we were best friends or could be best friends had I been born in his Era. I feel angry sometimes because I didn’t attend his funeral. I feel jealous sometimes because I wish I was one of his friends in Gaza or outside whom he used to see and\or write to. It strikes me how familiar and identical Gaza sounds in his letter. Its like he is among us now. His letter is ageless, I wonder if he ever imagined that so many years will pass but Gaza will remain Gaza. The only difference is that more blood flows in Gaza streets reflecting a red that can be felt but not seen. The debris of defeat has created a fog and more sadness camps on Gaza. Yet, more steadfastness took place and life still goes on like it went on when he wrote this letter. For a split second, I felt like I wrote this letter or it was written to me yesterday. There is allot of Ghassan Kanafani in me and allot of me in him, I wish he was here so I could tell him that. Anyway, I'm sure his soul got my message. Just like Ghassan, I always undergo the fiasco\inner conflict\dilemma of "should I leave or should I stay?" for the same reasons or atleast similar reasons or just my reasons. Starting from the end requires from me to go back to the beginning. This year started with the continuation of revolutions in the Arab world. Revolutions that I was very attached to. I wouldn’t sleep, glued to the TV watching the latest news from Tahrir and\or Syria and\or Bahrain and\or Yemen and\or Libya and ofcourse the latest news of my own country –Palestine- even though unfortunately we weren’t going through any revolutions here. I then joined MSF's (Doctors without Borders – France) office in Gaza to live a once-in-a-live-time experience that came out of nowhere and was very unexpected. I learned things in 5 months that I couldn’t have learned in 10 years. The best and most exhausting 5 months in my life. I got a wide access to Gaza and the INGOs world here. I discovered shocking things and I witnessed good and bad things after careful observation. Yet, I felt a tremendous pride for being MSF member and MSF felt pride to have me aboard. Its sad to see that those 5 months have come to an end but its time to move on. I will come out with endless amazing memories and people who will be my friends for life. Plus, a very worthy experience and an unimaginable honor. On my birthday this year, my grandmother was sick and got sicker and this totally ruined my birthday. I love her so much so I couldn’t help be affected by her sickness. Her health kept declining until we were all able to see in May that she is living her last days. I kept preparing myself for the inevitable but later I learned that no matter how hard you prepare yourself, you will never be ready to lose a loved one. On June 22nd, Friday, I had a bath and left to my best friend's house. Before I left, I saw my sister leaning next to my grandma's bed while she is asleep and reading her Qura'an. I asked her "why?" and she said she just felt like doing it. 15 minutes after my arrival to my best friend's house, I got a call from home: "Come, something bad has happened", my heart told me that the moment I fret just happened. I rushed home accompanied by Ziad my best friend and I was calm. Then, out of nowhere, felt like air is abandoning my body, like I was about to dive into oblivion, like I was about to go mad, like my mind was about to explode. Half way home, in the cab, I got my first ever panic attack. I never experienced panic attacks before; I only heard about them and saw them on TV. They aren’t pretty or easy. I arrived home and saw the ambulance parked downstairs. Suddenly, I had to face the ugly truth. Teta is gone. My grandma is no longer with us. I went down from the cab, threw my bag on the floor and rushed upstairs. Teta is dead, she passed away. I realized that after 12 continuous and strong panic attacks. I thought I was prepared; my body had a different story to tell. Numbness take over when you cant deal with a big loss. Teta wasn’t just a grandma; she was a second mother who kept us together after I lost my mom at the age of 9 and a half. After her death I felt motherless, a feeling so cruel and dark and cold that I felt a constant chill in my spine. I feel that I'm still in denial. Farewell Grandma, you battled cancer for 13 years, you raised children and grandchildren and you taught us to love Palestine like you did. You lived a full life, you had an exceptional willpower and you kept Palestine in your heart then passed it onto ours. May you rest in peace and know that you will never ever be forgotten. As if I wasn’t overwhelmed enough with everything around, Egypt was unstable and Morsi won the elections. Speculations here and in Egypt were flying like flocks and flocks of birds. I didn’t know what to feel. Its either Morsi or Shafiq. Bad and worse. I felt sorry for Egypt and Egyptians. I felt their frustration and showed my support. I still crave visiting tahrir square and all my friends there. I still have respect for Egypt. Moving on to Palestine. Hmmm I don’t know what to say. I wake up every day craving the west bank and the stolen lands of 1948. I miss Palestine. My soul yearns for Palestine. I want to visit Nazareth and all my family there. I want to visit Safad and relive all the memories that my grandma told me about it and how her heart broke when the huge expulsion of 1948 took place. She always wished and wanted to go back there one day. I am worried about Palestine. The Palestinian cause has been and still is making a huge progress regarding awareness, BDS and such but the Palestinian cause internally is nearly lost. Palestinians are two seconds away of giving up. Our internal issues are screwed up. We are divided and I think that we require a miracle to unite and free Palestine. I hope god is listening. Finally, I would like to thank you all for being my friends, loyal fans and having continuous interested in my blog even when life's pressures force me to abandon it for a while. I also want to thank you all for helping me be real, raw and emotional while I share my stories with you.